Also titled "Brock's Midnight Gallup"
1983 - Charles W. Jefferys. Curators: David W. Rudkin, University of Toronto Archives, Toronto, Ontario; 1983.10.03 - 1983.10.10. The first attempt at invasion by the Americans had failed at Detroit. Along the Niagara River gathered another American army. The summer passed into fall without an attack; but every week brought more troops and greater preparations by the enemy. October came, and it was certain that within a few days a blow would be struck. Just where it would fall Brock could only guess. From such information as he could gather, he judged that the attempt would be made either at the mouth of the river, or at Queenston, seven miles farther up, where the high ridge that ran at right angles across the Niagara formed a strong military pos1t10n. It was necessary to guard both ends of this seven-mile line, and at the same time keep a constant watch along the whole length of river from lake to lake. Heavy cannon were placed on projecting points to sweep the stream, companies of regulars and militia were stationed here and there, sentries patrolled the banks night and day. Brock's forces were scanty, and he could muster only about a quarter of the numbers opposed to him. The days grew shorter, cold rains swept up and down the river gorge, and the dripping sentries plodded through mud and sodden leaves on their weary rounds, protecting the locks of their muskets under the capes of their overcoats, snuggling their chins close into their stiff leather stocks. In Fort George at the river mouth, Brock watched and waited. On the night of the 12th of October, a night of autumn rain and wind, he sat late writing dispatches. He lay down for a few hours' rest; but shortly before dawn the booming of cannon from up the river awakened him. The garrison was aroused; Brock mounted in readiness to proceed to the threatened point. For a short space he waited anxiously. Was the firing up the river merely a feint to distract his attention from a main attack at Fort George, or was the enemy in force at Queenston? A dragoon came galloping with news that the Americans were crossing the river there in great numbers and attacking the British troops holding the village. Evidently Queenston was the point of invasion. Brock ordered Sheaffe, his second in command, to open fire on the American Fort Niagara, and at once galloped off up the river. According to tradition, as he rode out of Newark, he stopped for a moment at a house where Miss Sophia Shaw was living with her brother-in-law, Captain John Powell. It is said that Brock and Miss Shaw were engaged, and that they met for a few brief words in the dim light of the wild October morning. Grey dawn was coming, with flying clouds, and bursts of rain. The road was heavy with mud, and water brimmed the ruts. 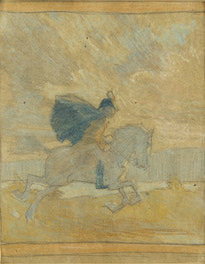 Brock's horse was his grey charger, Alfred, a present from his old friend, Sir James Craig, the late governor of Canada, who had sent him with the commendation that "the whole continent of America could not furnish so safe and excellent a horse." Well did Alfred live up to his reputation. 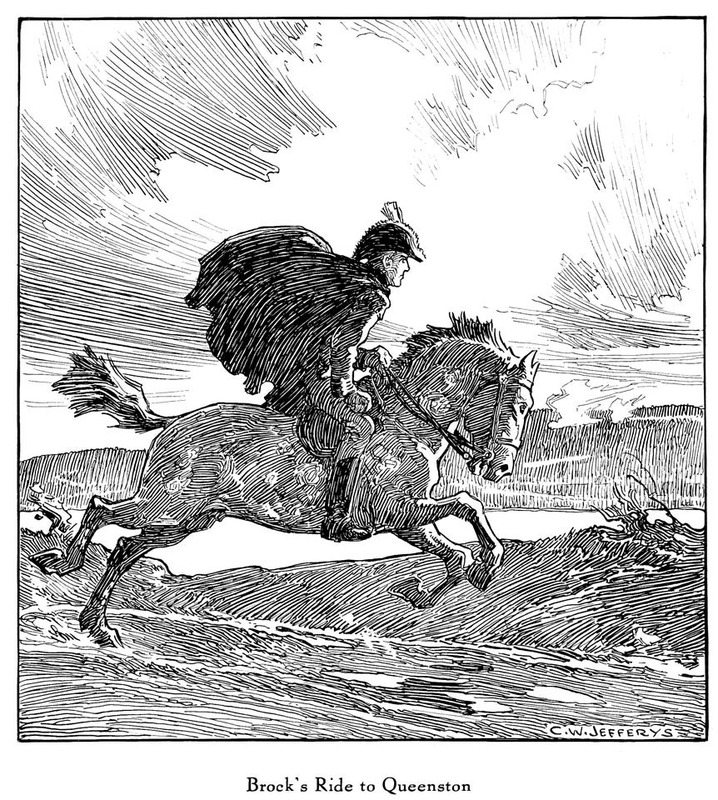 Brock rode at breakneck speed; but Alfred bore him safe and surefooted the seven-mile race along the slippery road. 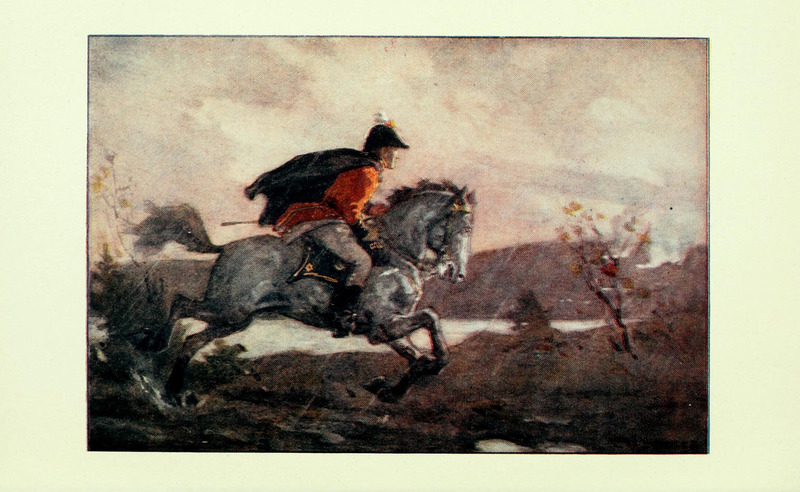 A mounted lieutenant, riding hard from Queenston, met him. 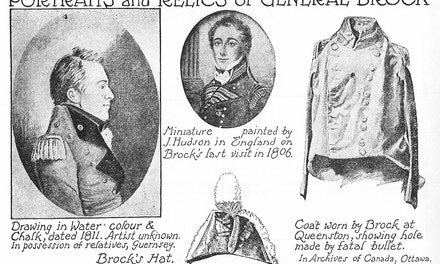 Brock did not draw rein; but beckoned to him to turn, and listened to his news as the messenger galloped alongside him; then sent him on to Fort George with orders to Sheaffe to hurry every available man to Queenston. Brock reached the first batteries, and the river opened to his view. Flashes of light burst from the heights of Lewiston across the river, the gorge echoed to the roar of cannon, and in the eddies of the swift current were seen dimly the boats of the attacking Americans. From the Queenston landing and from a single gun halfway up on the Heights, musketry and cannon fire replied steadily. The little British force was holding the enemy in check. In the outskirts of the village, Brock overtook a company of York militia hurrying along in the muddy road to the support of the defenders of Queenston. He waved his hand to them and cheered them on. Not far behind him galloped his two aides, Lieut. Col. Macdonnell of Glengarry and Capt. Glegg. For Brock and for Macdonnell it was a ride to Death. Within an hour, Brock lay dead on the hillside, and his gallant young aide fell mortally wounded. The Americans, repulsed in their attempt to land at the village, directed some of their boats further upstream, where, hidden by the projecting cliffs, they got on shore unperceived. A rough fisherman's path led them up the forest clad rocks to the crest of the Heights above the one-gun battery. Brock had ridden up to the battery and had dismounted to direct its fire, when suddenly the Americans emerged from the shelter of the woods and, rushing forward, forced the handful of artillerymen to retreat hastily down the hill to the main body of the British, Brock, not waiting to mount, leading the faithful Alfred by the bridle. The Americans must be driven from the Heights before their numbers increased. Brock formed his men into line, and led them on foot up the hill slope, slippery with the autumn rains. His tall, scarlet-coated figure was a conspicuous mark. A bullet struck him in the breast, and he fell, dying almost instantly. His troops tried to continue their advance; but Macdonnell was severely wounded, several other officers were disabled, and the British fell back to the lower end of the village, while the Americans strengthened their position, and reinforcements crossed the river to their support. Sheaffe, meanwhile, had advanced from Fort George, calling in all the British forces stationed along the frontier. By the afternoon every available man had been gathered and Sheaffe moved to attack the invaders. Circling widely to the west he reached the high ground of the Ridge, along which he advanced. Closing in rapidly, the British force, which included regulars, Canadian militia, Indians from the Grand River, and a company of negroes, drove the Americans to the very edge of the precipice, and forced them to surrender to the number of over nine hundred. The second attempt at invasion was foiled. It cost the life of the leader, but his example and spirit lived on. 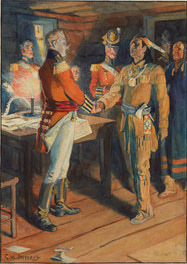 Throughout the years of the war, on all the long frontier from Michilimackinac to Chateauguay, the inspiration and the symbol of devoted courage for the defenders of Canada was the gallant figure of Brock riding through the dawn to Death.